Here is a very simple but effective tip: use print areas. Oh.. but what is a print area? Imagine looking at a report or dashboard worksheet. Now, that sheet also has few calculations, some extra stuff to the right of the report. When you print, you don’t need those extra elements. Just the report will do. This is where print areas can help. 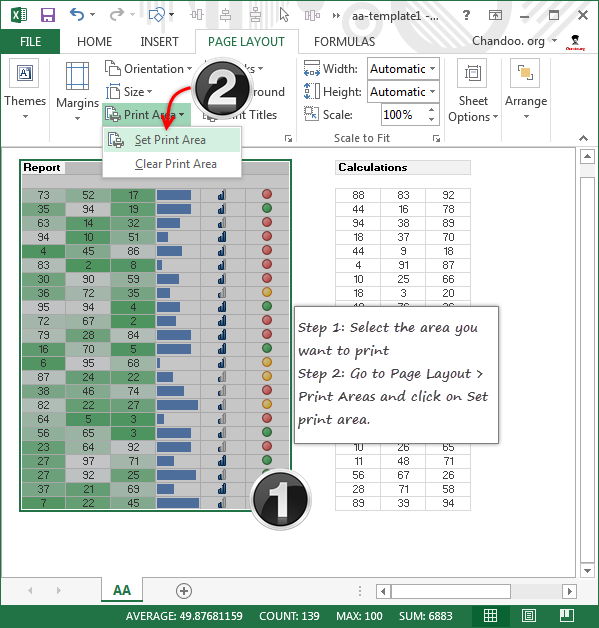 When you set up a print area, Excel will print only the contents of print area. Nothing else. There are just 2 steps. Your print area is ready. Now when you print (or save as PDF) the worksheet, Excel will only print the contents of Print area you have set. This saves you a lot of time and paper. Do you use print areas? I have been a fan of print areas ever since I learned about them few years ago. I use them on whenever there is a possibility of my workbooks getting printed. What about you? Have you heard about print areas? How do you use them to simplify your work? Please share your tips in the comments section. I want the ability to do multiple print areas on the same worksheet...so when you print, you could select a "named" print area and know what you're getting. For instance you could have one area named "Data", and one named "Graph". @Omohundro, Thanks for your comment. Watch out today's post for explanation on this. You da man, Purna! I was thinking you could probably set something like that up that might be macro- or VBA-driven. Thanks!! Every report/dashboard I set up uses Print Areas - even if the supporting data is located on another worksheet. Not only does it save paper, it helps make your final product look more professional if printed. I agree completely Melissa - it also helps to keep managers from scratching their heads and wondering why that stray column printed out on page two. My files have print areas - and they almost always have the page width set to scale to fit.